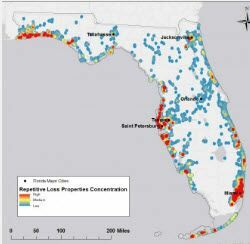 The study, published in the Journal of Ocean and Coastal Economics, focused on the problem of "repetitive loss properties" and aimed to identify lands in Florida that are potential targets for projects with multiple benefits: reduced flood exposure, conservation benefits, and remediation of social vulnerability. The study shows the location of more than 15,000 repetitive loss properties in Florida which, collectively, filed more than 40,000 claims against the National Flood Insurance Program between 1978 and 2011 (more than 1,200 claims per year, on average). As of March 2016, the National Flood Insurance Program, which is up for reauthorization in 2017, owed the U.S. Treasury $23 billion.